Know C F Vigor High Class of 1969 graduates that are NOT on this List? Help us Update the 1969 Class List by adding missing names. 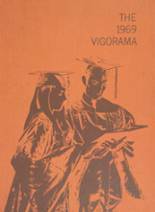 More 1969 alumni from C F Vigor HS have posted profiles on Classmates.com®. Click here to register for free at Classmates.com® and view other 1969 alumni. Alumni from the C F Vigor High School class of 1969 that have been added to this alumni directory are shown on this page. All of the people on this page graduated in '69 from C F Vigor High. You can register for free to add your name to the CFVHS alumni directory.